UNIQUE Firestop Pipe Collar is a steel collar lined with an intumescent silicone strip suitable for firestopping 1.5″, 2”, 3”, 4″, 5″, or 6″ nominal trade size plastic pipes where they penetrate fire-rated floors and walls. UNIQUE’s Intumescent Firestop Pipe Collar provides a ready-to-use solution for firestopping nominal trade size plastic pipes that penetrate fire-rated floors or walls. Easy to install to save labor time. Lightweight and durable. UL rated. Available on the website in 6 sizes for 1.5″, 2”, 3”, 4″, 5″, or 6″ plastic pipes. 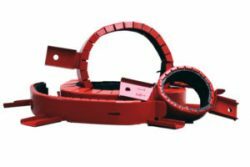 The steel collar is lined with an intumescent strip that expands when exposed to fire for 2 hours of firestopping protection when installed as directed. Take our Free Training and Certification Test to become one of our Certified Installers and receive referrals from the UNIQUE Installers Map and special discounted pricing on our products.